Why is the first step always 73.73 kB while downloading from Google Play Store? My phone is a OnePlus 5T running Android 8.1. 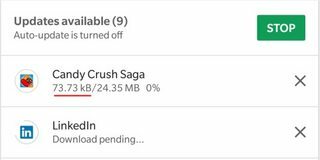 While downloading or updating apps from Google Play Store, the first step is always 73.73 kB. I'm just curious. Is there any technical reason (e.g. file system) for that? The answer to the question depends on a few different variables, such as specific internet types, always come with high latency and low bandwidth, such as some satellite hookups, or dial up hookups if used. If you do not have a stable internet connection, and your bandwidth is not consistent enough to be that bandwidth at all times, then perhaps your phone's wifi/data chip is only pulling that fast, or there could be background network applications running that are taking up all the bandwidth. If applications besides the one you are downloading something on are open, or apps have background processes using the network, that could be a cause of it. The last option that i can think of is you could be getting throttled by your router, check your router for anything limiting, throttling, or prioritizing anyone's IP or mac addresses. Generally 10.0.0.1, 10.0.0.2, 192.168.1.1, 192.168.0.1, 192.168.1.0 or if you know you router is using another local ip address, login using that and sometime the default user is admin, with password of admin, password, or blank in most cases. All else fails, it must be some sort of bug in your device, the apps, or some code between your device and the server. Where does the Play Store store the apps I am currently downloading? Why doesn't Google Play perform partial updates, rather than re-downloading the entire app? Why is 'no connection' error appearing while accessing Google Play store? Google Play Store accounts for over 50% of battery use! Solutions?